All sports have matching supplementary activities, so as one may be your primary sport, the other your secondary. This could be a seasonal factor, so as in the winter months, one of these sports is better suited to the other and some of the best examples of this is the practical realities of water sports and snow sports and the varieties of activities they offer. Importantly, they often replicate very similar bio-mechanical and balance demands made of the rider which has for many years, found mass appeal amongst water men and women who know this to be true. Snow and ice, is merely frozen water and so by default you could speculate that the primary difference between water sports and winter snow and ice sports is simply the extremes of water temperature, where water is hardened, frozen and the molecules reduced to zero velocity. With this in mind, SUP is very probably one of the best cross-platform related sports in line with snow skiing and many of its variants and more especially cross-country skiing (Langlaufing) which replicates many of the demands required of the rider. 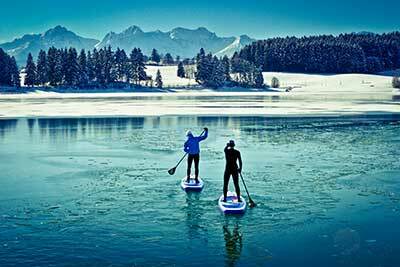 SUP need not be your primary sport, but if cross-country skiing is, then SUP is the perfect companion for you to take up and embrace once the snow has melted away. The action of pushing down on ski poles, the demands made of balancing, the requirement for both upper and lower body core strength and fitness, are all replicated when carrying out sound SUP technique. 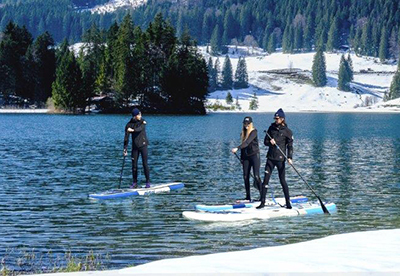 With winter soon to turn to spring in Europe and elsewhere around the Northern Hemisphere, if skiing is your thing and you want to improve and maintain fitness levels, SUP would make the perfect companion and Mistral the ideal pathway to get involved and make it a part of your lifestyle.